α1-Antitrypsin (AT) deficiency is a hereditary disorder that may lead to early-onset emphysema, and chronic liver disease later in life. Although there are validated methods for testing, the vast majority of α1-AT-deficient individuals remain undiagnosed. Recommendations have been published for the testing and diagnosis of α1-AT deficiency; however, guidelines on best practice are not well established. In our article, we review the developments in diagnostic techniques that have taken place in recent years, and describe the practices used in our three European centres. The determination of the level of α1-AT and genotyping are reported as the main diagnostic steps, whereas isoelectric focusing (also referred to as phenotyping) is reserved for confirmatory analysis. The following recommendations for best practice are put forward: detection of all PiZZ and other severe deficiency individuals; automated genotyping; preparation of reference standards; quality control programmes; development of standard operating procedure documents; and standardised methods for the collection of dried blood samples. Closer cooperation between laboratories and the sharing of knowledge are recommended, with the objectives of improving the efficiency of the diagnosis of severe α1-AT deficiency, increasing the numbers of individuals who are detected with the disorder, and assisting the establishment of new patient identification programmes. Deficiency of α1-antitrypsin (α1-AT) is one of the most common hereditary disorders worldwide. The main physiological role of α1-AT (also known as alpha-1 proteinase inhibitor) is to protect lung tissue from damage by proteolytic enzymes, in particular neutrophil elastase. Synthesis of α1-AT takes place predominantly within the liver. In α1-AT deficiency, polymerisation of the α1-AT glycoprotein leads to its accumulation within the hepatocytes, and reduced levels are released into the circulation. When the concentration of pulmonary α1-AT is low, neutrophil elastase is not neutralised by α1-AT and can destroy lung tissue, resulting in early-onset emphysema, particularly in smokers. A further clinical manifestation of specific mutations of the SERPINA1 gene that encodes for α1-AT is liver disease, presenting in infancy as hepatitis and jaundice, and as cirrhosis in children and adults. Synthesis of α1-AT is controlled by the codominant expression of two alleles, and individuals with α1-AT deficiency have inherited two abnormal proteinase inhibitor (Pi) alleles at the α1-AT gene locus. The principal normal allele is the M allele, and the PiMM genotype is present in 94–96% of Caucasians 1. The most common deficient variant is the Z allele, and >95% of individuals with severe α1-AT deficiency carry the PiZZ genotype 2. The serum α1-AT levels measured in individuals with the PiMM and PiZZ genotypes are 20–48 μM (1.5–3.5 g·L−1) and 2.5–7 μM (0.20–0.45 g·L−1), respectively, and a concentration of <11 μM (0.80 g·L−1-radial immuno<1?show=[fo]?>diffusion, or 0.50 g·L−1-nephelometry, see below) is associated with an increased risk of emphysema 3. The great majority of individuals with α1-AT deficiency have not been recognised; however, validated methods for the measurement of the levels of α1-AT in the blood, and for the definitive diagnosis of α1-AT deficiency through determination of the individual's genetic composition at the Pi locus, have been available for many years. The World Health Organization (WHO) and the American Thoracic Society (ATS), in collaboration with the European Respiratory Society (ERS), have produced reports 3, 4 that include recommendations for screening and testing for α1-AT deficiency using these well-established procedures. However, the WHO and ATS/ERS recommendations do not provide best practice guidelines on the implementation of a screening or diagnostic programme and, as yet, an ideal algorithm of laboratory procedures for case detection of α1-AT deficiency carriers has not been established. Since the most recent publication of the ATS/ERS recommendations in 2003, there have been further advances in the techniques available for the diagnosis of α1-AT deficiency. Our article will describe existing practices being used at our three European centres that have expertise in the testing and diagnosis of the disorder. Our laboratories have taken advantage of, and utilised, the improvements in diagnostic methodology. We wish to share our experience with the objectives of enhancing the quality and efficiency of the laboratory diagnosis of α1-AT deficiency, and facilitating the establishment of successful diagnostic programmes to detect greater numbers of affected individuals. Epidemiological studies suggest that ∼100,000 individuals in the USA have α1-AT deficiency 3, as have a similar number in Europe 2. The epidemiology and geographical distribution of α1-AT deficiency have been reviewed by many authors 2, 5–8. It is estimated that there are 3.4 million individuals worldwide with the PiZZ, PiSZ or PiSS genotypes, and 116 million individuals who are heterozygous for the disorder with the PiMZ or PiMS genotypes 7. Targeted screening studies have been carried out in several countries to detect cases of α1-AT deficiency by determining the frequency of the Z and S alleles in samples from individuals presenting with chronic obstructive pulmonary disease (COPD) 9–13. Despite the fact that α1-AT deficiency was first reported in the 1960s, the number of individuals diagnosed with the disorder is only a small proportion of that predicted from screening studies and estimates of gene frequency. <10% of individuals in the USA who have α1-AT deficiency have been identified 13–15, and it is estimated that up to 3% of patients with COPD in the USA may have undiagnosed α1-AT deficiency 4. A survey of 305,009 expected cases of α1-AT deficiency in eight other countries has shown that only 1,068 of these cases were actually diagnosed 8. Prolonged delays in making the diagnosis are also commonplace; whereas most individuals are never diagnosed, a study carried out among a small subset of individuals who were eventually diagnosed found that a mean of 7.2 yrs elapsed between the onset of symptoms and the diagnosis of α1-AT deficiency, and that 44% of individuals reported seeing at least three physicians before diagnosis 16. More recently, an average diagnostic delay of 8.3 yrs has been reported 15. There are at least two reasons to explain why α1-AT deficiency is under-recognised by the medical community. First, many physicians are unfamiliar with the disorder and not aware that pulmonary conditions, similar to those in individuals presenting with ordinary (i.e. smoking-related) COPD may in fact be due to α1-AT deficiency. They may also be unaware that symptoms of liver disease can also result from α1-AT deficiency. Secondly, many subjects with severe α1-AT deficiency may not have developed clinically significant impairment of lung function and may have no clinical symptoms 8. In their statement on standards for the diagnosis and management of α1-AT deficiency 3, the ATS/ERS provided recommendations regarding whether genetic testing should or should not be carried out. These were graded according to the level of supportive evidence for such testing, taking into account both the benefits of testing and the adverse issues involved (psychological effects on the individual, economic costs and ethical considerations). The clinical settings for which genetic testing was definitely recommended (a type A recommendation) are shown in table 1⇓. The ATS/ERS also advised that every individual with a low α1-AT level should be tested once by either phenotyping (isoelectric focusing) or genotyping. The WHO has recommended that all individuals with COPD, adults and adolescents with asthma, and all individuals with a family history of the disorder should be screened once for α1-AT deficiency using a quantitative test 4. All subjects with abnormal levels of α1-AT in the blood should subsequently undergo phenotyping. Unfortunately the guidelines described above for the testing of α1-AT deficiency, in particular the recommendation to test all symptomatic adults with COPD, are not routinely followed. In order to help physicians recognise the disease, the ATS and ERS have emphasised the following conditions that should prompt suspicion of α1-AT deficiency: early-onset COPD (age <45 yrs); emphysema in the absence of a recognised risk factor (e.g. smoking); emphysema with prominent basilar hyperlucency; bronchiectasis without evident aetiology; unexplained liver disease; vasculitic syndromes (anti-proteinase-3-vasculitis, necrotising panniculitis) 3. α1-AT deficiency should also be suspected in individuals with a family history of emphysema, bronchiectasis, liver disease, panniculitis, or the disorder itself. However, we must keep in mind that the real goal that has to be achieved is to test all patients with COPD at least once in their lives 3, 4. As in other adult-onset genetic disorders, the identification of individuals with mutations predisposing to α1-AT deficiency can motivate these individuals to avoid risk factors for symptomatic disease, such as cigarette smoking and exposure to environmental pollutants. Studies have shown a lower frequency of smoking in adolescence among individuals identified at birth as having α1-AT deficiency compared with matched control groups 17, 18, and an increased motivation to stop smoking among adults diagnosed with a genotype for α1-AT deficiency 19, 20. However, such benefits need to be weighed against psychological effects, such as an individual's anxiety about their predisposition to disease, and there are other adverse effects of genetic testing, such as discrimination by employers and the refusal of health insurance. Furthermore, in the case of a hereditary disorder, such as α1-AT deficiency, genetic testing also has implications for family members. It is recommended that patients are provided with information on α1-AT deficiency and that the implications (medical, social, emotional) of genetic testing are carefully explained 3. Procedures for testing for α1-AT deficiency have been available since the 1960s, and new techniques have been introduced during the intervening years. These advances in methodology should facilitate the widespread application of more rapid, convenient and cost-effective tests for α1-AT deficiency and thus lead to an increase in the numbers of individuals diagnosed with the disorder 21. The different methods that have currently been validated for both testing and diagnosis of the disorder are assessed in tables 2⇓ and 3⇓. Large-scale screening programmes for α1-AT deficiency have previously been hindered by the need to draw intravenous blood and then transport the potentially bio-hazardous specimens to the testing laboratory. Over the past few years, the use of dried blood spots (DBS) has been initiated, whereby testing is carried out on a few drops of blood that have been dried onto filter paper (number 903; Schleicher & Schuell, Bioscience Inc., Keene, NH, USA). The applicability and reliability of the DBS method for α1-AT deficiency testing have been described extensively 9–11, 21, 23–26. The advantages and disadvantages of using whole blood samples and DBS are reviewed in table 2⇑. The tests used for the measurement of α1-AT levels in the blood (immunoassay techniques, nephelometry), as well as diagnostic procedures (phenotyping and genotyping methodology), are listed in table 3⇑. The initial issues that we wanted to address were, first, “Who should be screened?” and, secondly, “Should screening be carried out only by measurement of the α1-AT concentration in the blood, or should individuals be fully diagnosed by identification of the alleles at the α1-AT gene locus?”. We decided to call our initial testing procedures “targeted detection” instead of either diagnosis or screening because, clearly, the priority should be given to individuals with COPD. However, the question, “Who should be targeted for detection?” cannot be answered fully and depends on the resources available. The steps in targeted detection and diagnosis would include the categories presented in table 1⇑. Whereas methods have been validated for testing for α1-AT deficiency, there is no one established algorithm for the detection and diagnosis of the disorder that is universally used by laboratories and countries around the world. It is important, therefore, to compare and review current procedures and initiatives being undertaken at different centres. From such sharing of knowledge, we can develop recommendations for effective methodology and diagnostic algorithms. We report here the procedures currently employed in three laboratories in Europe working on national programmes for the detection of α1-AT deficiency, namely the University of Pavia, Italy; the University of Marburg, Germany; and the Biochemistry Laboratory at Vall d'Hebron Hospital, Barcelona, Spain. The algorithms for targeted detection currently used by each of these centres are illustrated in figures 1⇓–⇓3⇓. In Pavia (fig. 1⇓), genotyping is performed at the first stage of the algorithm, simultaneously with the quantitative measurement of α1-AT levels. At the other two laboratories (figs 2⇓ and 3⇓), determination of the α1-AT level preceded genotyping. In a study undertaken in Barcelona, an analysis of 971 samples from COPD patients found that none of the samples with normal α1-AT levels were from individuals carrying the PiZZ phenotype. For the reason of cost, it was decided to perform genotyping only on samples containing α1-AT at a concentration in DBS equivalent to <1 g·L−1 (∼14 μM). When this procedure was undertaken on a further 1,166 samples, a reduction in cost of 30% was achieved compared with the cost that would have been incurred if all 2,137 samples had been screened for genotype 11. The current practice recommended by the Spanish Registry, therefore, is for laboratories to determine α1-AT levels, and then send only those samples with concentrations below normal to the Barcelona centre for genotyping to identify Z and S alleles. Testing algorithm from University of Pavia, Pavia, Italy. DBS: dried blood spot; α1-AT: α1-antitrypsin; IEF: isoelectric focusing. Testing algorithm for targeted detection from the Vall d'Hebron Laboratory, Barcelona, Spain. DBS: dried blood spot; α1-AT: α1-antitrypsin; IEF: isoelectric focusing. Testing algorithm from University of Marburg, Marburg, Germany. α1-AT: α1-antitrypsin; DBS: dried blood spot; IEF: isoelectric focusing. Phenotyping was carried out at the Pavia and Marburg centres only on samples with an α1-AT level previously determined as below normal, after the prior detection of a Z or S variant by genotyping, or in the case of discrepancy between α1-AT level and genotype. By contrast, in Barcelona, phenotyping was not performed at any stage in targeted detection programmes, and is reserved only for diagnosis assessment in the same situations described for Pavia and Marburg, mainly after detection of low α1-AT concentrations, or again in the case of discrepancy between α1-AT level and genotype. In general, the initial sample tested is in the form of a DBS, with whole blood samples being collected only for confirmatory testing and for DNA sequencing. Sequencing of exonic DNA was normally the final procedure carried out to determine the actual variant present in the sample when a polymerase chain reaction (PCR) was unable to provide a complete identification of both α1-AT alleles. We advocate that a primary aim of any diagnosis programme should be to detect all individuals with the ZZ phenotype. Detection of the S allele is a secondary goal if resources are limited. Genotyping using PCR has the advantage that a definitive answer is given, for example, as to whether Z or S alleles are present or not. The PCR methodology can be adapted for automation, i.e. rapid screening for the presence of S and Z alleles 27–29. An automated genotyping procedure may well be cheaper than other methods for screening higher numbers of individuals. 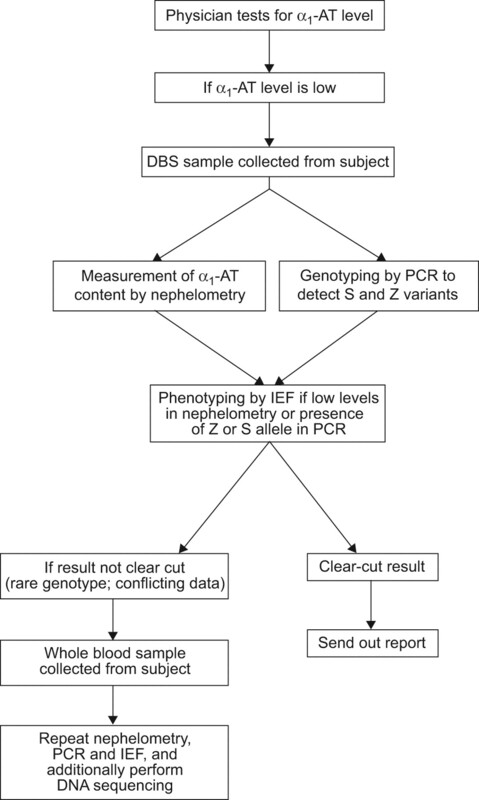 However, such an approach would not detect rare variants, and in these cases, further sequencing analysis would be needed to obtain a definitive diagnosis. Detection rates at each laboratory cannot be compared because they mostly depend on the characteristics of the patients screened, and only in part on the algorithm, as far as the cut-off of plasma α1-AT level is concerned 25. In routine practice, the detection of Z and S variants (present in both homozygous and heterozygous individuals) was observed in ∼30–35% of the total number of samples that have been tested by genotyping in Pavia, and in 12% of genotyped samples in Marburg. In Barcelona, the detection programme reserves genotyping for those samples with low concentrations of α1-AT, which represent ∼7–10% of the total samples according to the predefined threshold. Z and S variants were detected in 40% of these genotyped samples. Sequencing is performed for confirmation of the deficient allele when Z and S variants are not detected. Non-Z and non-S rare deficient alleles were detected in a further 10% of all genotyped samples in Pavia. In Marburg, three novel mutations and 45 rare genes have been detected among the 96 samples that have been sequenced. More data about the individual results of the detection programmes are available in the original publications 9, 11, 12, 30, 31. We recognise that improvements could be made to the collection of samples before they arrive at the laboratory for testing. Although shipment of DBS is easier and less costly than whole blood, and individuals can send the samples themselves, problems have arisen in the DBS collection process, and up to 15% of samples are rejected. A list of recommendations and practical suggestions to improve the DBS collection process and to lower the rejection rates is provided in table 4⇓. A key issue is the establishment of effective quality control processes in the different laboratories carrying out α1-AT deficiency testing. For example, in Germany, the laboratories are enrolled in external testing to maintain quality control of the PCR methods used. A major step would be the development of reference standards by each laboratory engaged in testing. These measures would assist the many laboratories in maintaining consistency when continuing to test samples over the longer term. With such measures in place, an additional initiative that should be considered is the development of a standard operating procedure document for quality control that would be available to laboratories setting up new programmes for α1-AT deficiency testing. Consistency within each laboratory is regarded as fundamental, and confidence in the use of reference standards would be built up over time and with experience. Costs per sample vary depending on the protocol applied and the local costs. The mean cost per sample tested in the detection programme in Barcelona (genotyping reserved for samples with low α1-AT concentrations only) is €13.4. In Pavia, genotyping has a cost of €13.5 per sample, plus a further cost of €5 for determining the level of C-reactive protein, which was performed on all samples. The detection programme in Marburg has a mean cost per sample of €33. The cost of sequencing is higher and depends on the equipment, but may range from €48 to €150. Insufficient numbers of individuals with α1-AT deficiency are currently being detected. The objective of our article is to facilitate the establishment of new patient identification programmes, in greater numbers of laboratories and in other countries, by sharing the experience gained at our three well-established European centres. In order to assist each new laboratory planning to set up a detection programme, our intention has been to provide a detailed description of the testing protocols and current diagnostic techniques, and to put forward our recommendations for improving laboratory practice. We should emphasise that the recommendations in our article are based on our own experience and are not official recommendations of any scientific society. Individuals with α1-AT deficiency may suffer from unexplained and inadequately managed lung conditions for many years. Despite clear recommendations from the WHO and ATS/ERS on the importance of diagnosis, physicians' practices are changing minimally; many physicians remain completely unaware of the disease and may see only one person diagnosed with α1-AT deficiency in their lifetime. In fact, α1-AT deficiency is a condition that has been described as “emerging from the shadows.” Early detection of α1-AT deficiency would enable individuals to make changes in their lifestyle (e.g. smoking cessation; exercising and pulmonary rehabilitation; oxygen supplementation; receiving nutritional support) to prevent the development of severe morbidity. In particular, tobacco smoking is highly correlated with the development of emphysema in subjects with α1-AT deficiency 32–34. Smokers may present with symptoms of pulmonary disease several years earlier (e.g. in the fourth decade of life 3), and suffer a more rapid decline in lung function 35–38. Importantly, early diagnosis of the disorder also enables individuals to receive effective treatment for α1-AT deficiency, such as augmentation therapy 39. Our article has reviewed validated procedures that are presently available to screen for, and to diagnose, α1-AT deficiency. Much progress has been made in the development of these methods since testing for α1-AT deficiency was first possible 40 yrs ago. However, a major challenge remains to utilise the techniques available to increase the numbers of individuals with α1-AT deficiency that are actually diagnosed with the disease. Some differences exist with regard to the procedures used by our centres, but these are relatively minor, at least for the identification of patients with severe α1-AT deficiency. As a consequence, it may be that some carriers of heterozygosity with α1-AT plasma levels above the cut-off are missed. There is increasing interest in such conditions as co-factors for lung and liver diseases, thus we can suppose that, in the future, detection programmes will be designed to include them in diagnostic flow charts. The major diagnostic steps, as shown in the algorithms, are shared by the three centres. Each of the algorithms includes genotyping, and it is considered necessary to detect all individuals with the PiZZ genotype. We agree that measurement of the level of α1-AT in the blood and the determination of the genotype are currently the two major diagnostic techniques. We regard phenotyping by isoelectric focusing as no longer the “gold standard” for diagnosing α1-AT deficiency (as had been mentioned in the ATS/ERS statement of a few years ago 3), and consider that isoelectric focusing should be used only as a reflex tool for confirmatory analysis. Furthermore, it should be noted that two other laboratories, both in the USA, also now accept genotyping and measurement of the α1-AT level as the main diagnostic approaches and have published the details of their algorithms, which are essentially similar to our own 40, 41. There may be good reasons to consider adapting the algorithms used in different laboratories and countries. A key motivational factor in driving laboratories to embrace new methodology is the need to develop less expensive techniques. For large case detection programmes, simple and cheap tests are necessary. Improvements should therefore be made to the testing methodology to increase efficiency and throughput. It is recommended that the individual laboratories should carry out a cost analysis of the different methods that they are currently using, to assist in the development of the most cost-effective approach to the targeted detection. This course of action could lead to the different laboratories using a more standardised process for testing and diagnosis. Where a consensus can be achieved in developing a standardised approach, a more consistent message can be presented to physicians to encourage them to participate in patient identification. We recommend that each laboratory use reference standards and propose that a collection of standard samples be sent out from a specialist centre to the laboratories so that they could prepare their own set of standards. Likewise, the establishment of a quality control programme is recommended for participation by existing screening and diagnostic laboratories, and also by laboratories that would begin to be involved in testing for α1-AT deficiency. Finally, technical developments are endorsed that could improve and expedite the DBS collection process. In order to increase the numbers of α1-AT-deficient individuals identified, it is necessary to raise further awareness of the disease. The success of diagnostic programmes rests largely on the enthusiasm and commitment of physicians and other healthcare providers; awareness strategies should therefore include ways to encourage the interest of the medical community. It is equally important to increase awareness among α1-AT-deficient individuals as well as more extensively, among the wider population. A key aspect of promotional campaigns to increase knowledge of α1-AT deficiency is to emphasise the main risk factors for the disease and the consequent need for lifestyle changes by affected individuals. As discussed above, tobacco smoking is strongly associated with the development of lung disease symptoms in individuals with α1-AT deficiency, and smoking cessation is a principal priority in the management of the disorder 30. There are many different ways to increase awareness of α1-AT deficiency; these are summarised in table 5⇓. In summary, small and not critical differences exist in the ways that laboratories currently perform severe α1-AT deficiency testing. However, closer cooperation, such as the sharing of protocols and technical knowledge between laboratories and countries (such as through the Alpha One International Registry (AIR) programme 43) would enable agreement to be reached, for example, on more efficient and cost-effective methodology. Recommendations can be made as to best practices to improve the diagnosis of α1-AT deficiency and increase the numbers of individuals identified (table 5⇑), and our current recommendations can be used to assist laboratories in setting up programmes for α1-AT deficiency testing in the future. Editorial assistance was provided by M. Kenig at PAREXEL and was supported by Talecris Biotherapeutics. Blanco I, de Serres FJ, Fernandez-Bustillo E, et al. Estimated numbers and prevalence of PI*S and PI*Z alleles of alpha1-antitrypsin deficiency in European countries. Eur Respir J 2006;2:77–84. American Thoracic Society/European Respiratory Society Statement. Standards for the diagnosis and management of individuals with alpha-1 antitrypsin deficiency. Am J Respir Crit Care Med 2003;168:818–900. α1-Antitrypsin deficiency: memorandum from a WHO meeting. Bull World Health Organ 1997;75:397–415. Hutchison DC. Alpha 1-antitrypsin deficiency in Europe: geographical distribution of Pi types S and Z. Respir Med 1998;92:367–377. Miravitlles M. Alpha 1-antitrypsin deficiency: epidemiology and prevalence. Respir Med 2000;94: Suppl. C S12–S15. De Serres FJ. Worldwide racial and ethnic distribution of alpha1-antitrypsin deficiency: summary of an analysis of published genetic epidemiologic surveys. Chest 2002;122:1818–1829. Luisetti M, Seersholm N. α1-Antitrypsin deficiency 1. Epidemiology of α1-Antitrypsin deficiency. Thorax 2004;59:164–169. Luisetti M, Massi G, Massobrio M, et al. A national program for detection of alpha1-antitrypsin deficiency in Italy. Respir Med 1999;93:169–172. Wencker M, Marx A, Konietzko N, et al. Screening for alpha-Pi deficiency in patients with lung diseases. Eur Respir J 2002;20:319–324. De La Roza C, Rodríguez-Frías F, Lara B, et al. Results of a case-detection program for alpha-1 antitrypsin deficiency in COPD patients. Eur Respir J 2005;26:616–622. Bals R, Koczulla R, Kotke V, et al. Identification of individuals with alpha-1-antitrypsin deficiency by a targeted screening program. Respir Med 2007;101:1708–1714. Aboussouan LS, Stoller JK. Detection of alpha-1 antitrypsin deficiency: a review. Respir Med 2009;103:335–341. Navickis RJ, Wilkes MM. Update on research, diagnosis and management of alpha1-antitrypsin deficiency. Highlights from the 3rd international Alpha One International Registry Meeting, June 2003, Barcelona, Spain. COPD 2004;1:279–292. Campos MA, Wanner A, Zhang G, et al. Trends in the diagnosis of symptomatic patients with α1-antitrypsin deficiency between 1968 and 2003. Chest 2005;128:1179–1186. Stoller JK. Alpha-1 antitrypsin deficiency: an under-recognized but important issue for respiratory therapists. Respir Care 2003;48:1022–1024. Thelin T, Sveger T, McNeil TF. Primary prevention in a high-risk group: smoking habits in adolescents with homozygous alpha-1-antitrypsin deficiency (ATD). Acta Paediatr 1996;85:1207–1212. Wall M, Moe E, Eisenberg J, et al. Long-term follow-up of a cohort of children with alpha-1-antitrypsin deficiency. J Pediatr 1990;116:248–251. McElvaney NG, Stoller JK, Buist AS, et al. Baseline characteristics of enrollees in the National Heart, Lung and Blood Institute Registry of alpha 1-antitrypsin deficiency. Alpha 1-Antitrypsin Deficiency Registry Study Group. Chest 1997;111:394–403. Carpenter M, Strange C, Dickson M, et al. Does genetic testing result in behavioural health change? Changes in smoking behaviour following testing for alpha-1 antitrypsin deficiency. Ann Behav Med 2007;33:22–28. Campbell EJ. Alpha1-antitrypsin deficiency: incidence and detection program. Respir Med 2000;94:S18–S21. Zerimech F, Hennache G, Bellon F, et al. Evaluation of a new Sebia isoelectrofocusing kit for alpha 1-antitrypsin phenotyping with the Hydrasys System. Clin Chem Lab Med 2008;46:260–263. Costa X, Jardí R, Rodríguez F, et al. Easy method for screening dried blood spot specimens on filter paper for alpha-1 antitrypsin deficiency. Eur Respir J 2000;15:1111–1115. Rodriguez F, Jardi R, Costa X, et al. Rapid screening for alpha1-antitrypsin deficiency in patients with chronic obstructive pulmonary disease using dried blood specimens. Am J Respir Crit Care Med 2002;166:814–817. Gorrini M, Ferrarotti I, Lupi A, et al. Validation of a rapid, simple method to measure alpha-1 antitrypsin in human dried blood spots. Clin Chem 2006;52:899–901. Ferrarotti I, Scabini R, Campo I, et al. Laboratory diagnosis of alpha1-antitrypsin deficiency. Transl Res 2007;150:267–274. Zorzetto M, Tamburnotti C, Maschietto B, et al. A fast amplification-reverse hybridization assay kit to detect the most frequent deficient variants in the alpha-1-antitrypsin gene. Respiration 2002;69:81–85. Ferrarotti I, Zorzetto M, Scabini R, et al. A novel method for rapid genotypic identification of alpha 1-antitrypsin variants. Diagn Mol Pathol 2004;13:160–163. Kaczor M, Sanak M, Szczeklik A. Rapid and inexpensive detection of alpha1-antitrypsin deficiency-related alleles S and Z by a real-time polymerase chain reaction suitable for a large-scale population-based screening. J Mol Diagn 2007;9:99–104. Ferrarotti I, Gorrini M, Scabini R, et al. Secondary outputs of alpha1-antitrypsin deficiency targeted detection programme. Respir Med 2008;102:354–358. Ferrarotti I, Baccheschi J, Zorzetto M, et al. Prevalence and phenotype of subjects carrying rare variants in the Italian registry for alpha1-antitrypsin deficiency. J Med Genet. 2005;42:282–287. Piitulainen E, Sveger T. Effect of clinical and environmental and clinical factors on lung function and respiratory symptoms in adolescents with alpha-1-antitrypsin deficiency. Acta Paediatr 1998;87:1120–1124. Corbo GM, Forastiere F, Agabti N, et al. Passive smoking and lung function in α(1)-antitrypsin heterozygote school-children. Thorax 2003;58:237–241. Tobin MJ, Cook PJ, Hutchison DC. Alpha 1 antitrypsin deficiency: the clinical and physiological features of pulmonary emphysema in subjects homozygous for Pi type Z. A survey by the British Thoracic Association. Br J Dis Chest 1983;77:14–27. Larsson C. Natural history and life expectancy in severe alpha-1-antitrypsin deficiency, Pi Z. Acta Med Scand 1978;204:345–351. Janus ED, Phillips NT, Carrell RW. Smoking, lung function, and alpha 1- antitrypsin deficiency. Lancet 1985;1:152–154. Seersholm N, Kok-Jensen A, Dirksen A. Decline in FEV1 among patients with severe hereditary alpha 1-antitrypsin deficiency type PiZ. Am J Respir Crit Care Med 1995;152:1922–1925. Piitulainen E, Eriksson S. Decline in FEV1 related to smoking status in individuals with severe α1-antitrypsin deficiency (PiZZ). Eur Respir J 1999;13:247–251. Tirado-Conde G, Lara B, Miravitlles M. Augmentation therapy for emphysema due to alpha-1-antitrypsin deficiency. Ther Adv Respir Dis 2008;2:13–21. Snyder MR, Katzmann JA, Butz ML, et al. 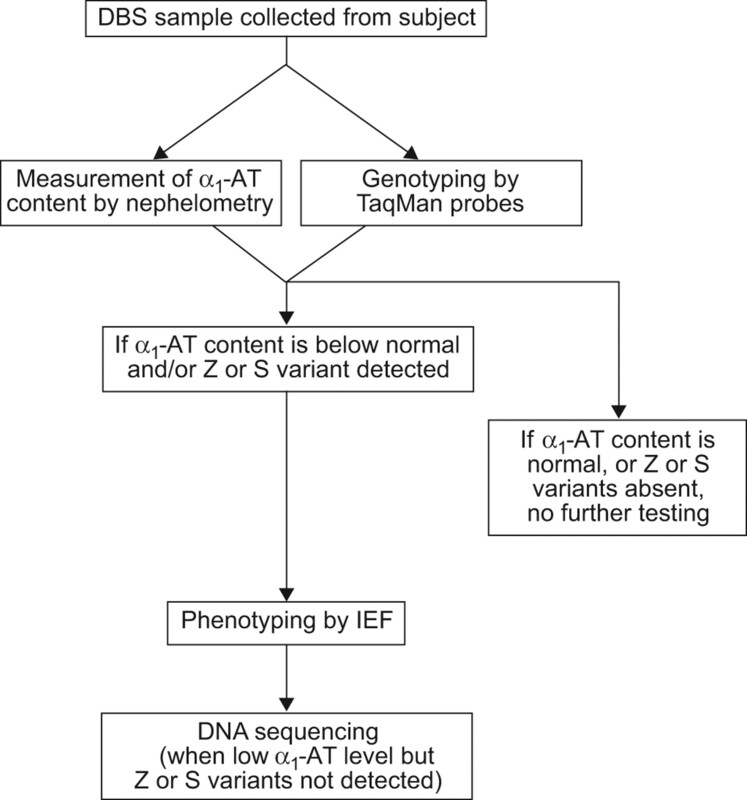 Diagnosis of alpha-1-antitrypsin deficiency: an algorithm of quantification, genotyping, and phenotyping. Clin Chem 2006;52:2236–2242. Bornhorst JA, Procter M, Meadows C, et al. Evaluation of an integrative diagnostic algorithm for the identification of people at risk for alpha1-antitrypsin deficiency. Am J Clin Pathol 2007;128:482–490. Rahaghi F, Ortega I, Rahaghi N, et al. Physician alert suggesting alpha-1 antitrypsin deficiency testing in pulmonary function test (PFT) results. COPD 2009;6:26–30. Stockley RA, Luisetti M, Miravitlles M, et al. Ongoing research in Europe: Alpha One International Registry (AIR) objectives and development. Eur Respir J 2007;29:582–586.